I saw the incomparably Martha Stewart on the Today Show last week showing off recipes and dishes from her new clean eating cook book. The last recipe was for chocolate pudding made with avocados….yes you read that right. And judging by the reactions of the co hosts, it was pretty awesome. And this guy? The proof is in the pudding, er, picture. The best part is that they get a guilt free dessert that is pretty close to a healthy food. Oh Martha, you’ve done it again! Ignore the recipe but look at the picture. My good friend bought everything to make this and then never did!!! Which really translates, I never got to try it Waaa!!! 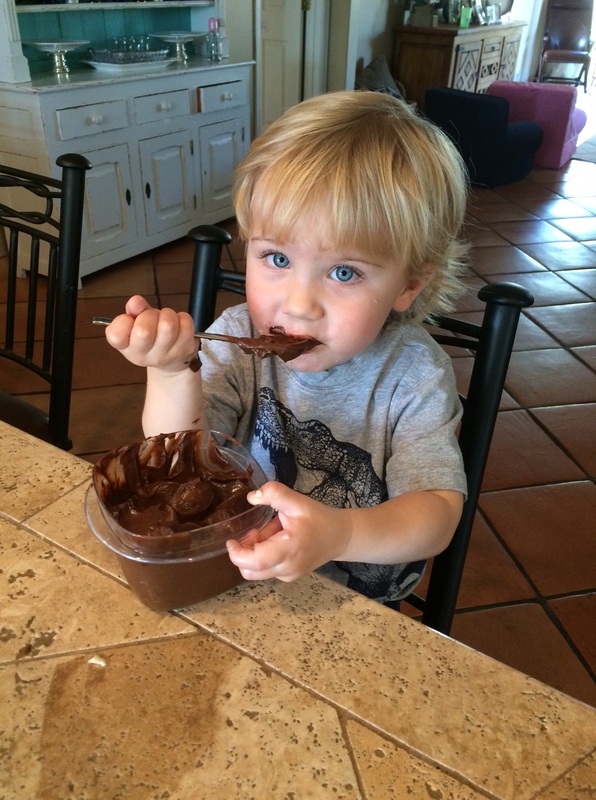 It does look delicious though, and your little one is adorable!!! I’m getting my good friend on the phone now to nag here – thank you for reminding me 😉 Love this!! Hi Beth, I love your posts and find it ironic that I made the same recipe last week, right after I made the Olive Garden Zuppa Toscana recipe from the 12 Tomatoes website. The soup,was great but I altered the ingredients to decrease the calorie intake. After the soup, I offered Roy some chocolate pudding. He has eaten two helpings, likes it and I have yet to tell him how it is made…tee hee! Keep exploring in the kitchen and treating the family to new culinary delights!